So where should I start? Maybe I should start when I was in the Navy and was transferred to Hawaii in 1993. I spent the first few years being a tourist, but it wasn’t until 1997 when I finally got into the ocean. A friend challenged me to compete in a local triathlon (Tinman Triathlon), so I joined a Triathlon Clinic (Boca Hawaii). They showed me how much fun it could be swimming, biking, running and enjoying competing in a healthy lifestyle. After a few years of competing, I decided to try an Ironman distance race. (2.4 mile swim, 112 mile bike, 26.2 mile run) I signed up for Ironman New Zealand and started my training with my friends. One month before the race, I had gone out on a short bike ride when my life changed. I was run over by a bus while riding my bike. I sustained a spinal cord injury (fused from T12-L5) and have lost partial function of my left leg and nerve damage below the waist. After seven months recovering from my injuries (Queens Hospital, Tripler Hospital, and Palo Alto SCI Clinic), I was finally released. When I got home, I didn’t want to leave my condo. Just wanted to stay home and just order delivery food. It was just too hard to go out and do things that I used to take for granted. (pushing in the wheelchair, take apart/put together the wheelchair, finding parking space that was wide enough that I could actually open the door to assemble and disassemble the chair while in the drivers seat. But I was fortunate. I have many friends (thank you Yuri and Julie for flying out to Palo Alto to help me fly home and get settled in) who wouldn’t let me stay at home and alienate myself from the real world. My friends would stop by and make me leave my condo and would “encourage” me to get into the ocean to swim or aqua jog. (Special thanks to Mati, Brenda and all of my other friends who was a part of my recovery). Before long, I was spending more time using my walker than my wheelchair and a couple of months later, I had abandoned the walker for a cane. During this process, I finally understood why they called playing in the ocean as “Ocean Therapy”. For me the ocean was my place to clear my mind and just enjoy the rocking of the waves. Feeling weightlessness in the water, while strengthening all my atrophied muscles. The ocean (and friends) definitely sped up my recovery. After a while, I began to wonder if I would ever be able to do things like I did before my accident such as competing in triathlons. I had no idea if it was even possible for someone with a disability. A couple of months later, there was an triathlon event by Challenged Athletes Foundation (CAF) called “Ironman Revisited” held on Oahu. A friend of mine contacted them and told them of my story and I was able to meet them at the event. They graciously offered me a grant to come participate in the “San Diego Challenge” (I did the swim portion of a relay team). All I can say was wow. I got to meet triathletes of all ages and with all types of disabilities. One young triathlete had lost both arms and legs, but participated in the swim portion of the race. She opened my eyes and showed me that our disabilities should not limit us on what we can do, She will always be my inspiration. Since then, I’ve competed in numerous triathlons including Tinman, Honu Half Ironman, Vineman Half Ironman, NYC Triathlon, ITU World Olympic Distance Triathlon Hamburg Germany, Ironman Western Australia and CAF Ironman Revisited (with Mati and Brenda). Ive competed in the Waikiki Swim Series and completed three Waikiki Roughwater Swims. Ive raced in the wheelchair division at the Honolulu Marathon, San Diego Rock n Roll Marathon, Disneyland Half Marathon, Disneyworld Half and Full Marathon. In 2011, I had finally decided that I needed to try something different, so I went back to my happy place, “the ocean”. 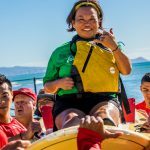 I decided to try outrigger canoe paddling and competed with both adaptive crews (Pure Light Racing) and several able bodied crews (Savu Savu Canoe Club – Fiji. Leduc Canoe Club – Canada, Flying Jandals – Australia, Team Arizona, and New Hope Canoe Club) I paddled both sprint and long distance races (iron and change), but Ive always enjoyed the longer distance races the most because I feel more relaxed and peaceful on the ocean during the longer races of over 2 hours. Ive been very fortunate to compete in some of the biggest outrigger races. Most notable races include: IVF World Sprints in Canada and Australia, Fiji International (30K Iron), Queen Lili’uokalani, Pailolo Challenge, Na Pali Challenge, Catalina Island Challenge, Liberty Challenge, Vaka Eiva (iron and change), USA Time Trials in Lake Placid NY, Gainesville Ga, and Moloka’i Hoe. After the 2017 outrigger racing season was over. I decided it was time to take a year off from paddling and try something new. In the past, my friends that are now adaptive surfers have been encouraging me to try surfing with “Accessurf”. Unfortunately, the “Day At The Beach” events were always on paddling training days. So this paddling break gave me a chance to try surfing. So in March 2018, I attended my first Accessurf DATB event. I guess I should start by saying that I have never surfed before. When I arrived at White Plains Beach, I realized this was a large event and very well organized. I watched for a while checking out the different adaptive equipment being used and how everyone had different ways to surf. They have plenty of volunteer support on the beach and on the water. Very safety conscious. Being completely new to the surfing, I had no idea what equipment or type of surfing I should try. I was worried about my spinal cord injury and if I would be able to sit on a surfboard, so we decided to try tandem prone surfing. It felt wonderful being on the water, but unfortunately it was a pretty flat day and wasn’t able to catch any waves. So for the next two monthly events (April/May), I decided to try the tandem waveski with Ryan. After the second time on the waveski, I knew I was hooked and ready to go solo. Once I was out surfing solo, I felt relaxed and comfortable and enjoyed the wonderful feeling of surfing the waves. Like I had mentioned before, it was so therapeutic being on the ocean and gave me a passion to continue surfing. Hopefully others will read this and decide to come out and try new experiences. Maybe surfing will be your new passion. 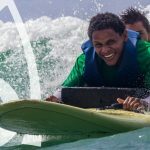 For those who have never tried adaptive surfing, you should give it a try. Accessurf events have plenty of volunteers and surfboards for you to try to figure out what works best for you. I cant tell you enough how therapeutic being on the water is, you just have to take my word and go out on the water and surf the waves. Ocean Therapy! Currently I have surfed at 11 Accessurf events (DATB and Wounded Warrior). Eight of them I’ve surfed solo on a waveski. Now I wondered why I had not tried adaptive surfing earlier. Now that I’m enjoying surfing so much, I wanted to get my own surfboard so that I can surf more than just twice a month at Accessurf Events. So I applied for a grant with “OneMoreWave” (I picked up the information at Accessurf). I am pleased to announce that my grant was approved and I will be receiving a custom built waveski from them soon. I hope anyone who reads my story will be inspired to come out and try adaptive surfing. Like I mentioned before, plenty of volunteers so no worries concerning safety, and they carry about every kind of surfboard imaginable and will be able to find the right surfboard for you. You will go out tandem for the first time so there is no need to be afraid that you might do something wrong. This is the best way for us to try something new. Get out of the house and live a healthy lifestyle. Meet new surfers, make new friends and your future surfing partners. I promise, you wont regret it.